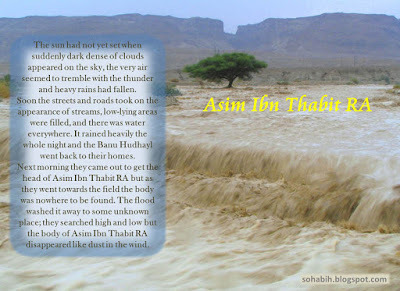 Asim ibn Thabit RA (Arabic: عاصم بن ثابت‎‎) was one of the Ansar, a person belonging to one of the first generations of Muslims and who helped Muhammad after his migration to Medina. Asim ibn Thabit RA participated in the Battle of Badr. Rasulullah ﷺ's forces included Saiyidina Abu Bakr RA, Saiyidina Umar Ibn Al Khattab RA, Saiyidina Ali Ibn Abi Talib RA, Saiyidina Hamzah Ibn Abdul Muttalib RA, Saiyidina Mus`ab ibn `Umair RA, Saiyidina Az-Zubair bin Al-'Awam RA, Saiyidina Ammar ibn Yasir RA, and Saiyidina Abu Dhār al-Ghifari RA. The Muslims also brought seventy camels and two horses, meaning that they either had to walk or fit three to four men per camel. However, many early Muslim sources indicate that no serious fighting was expected, and the future Saiyidina Othman Ibn Affan RA stayed behind to care for his sick wife Ruqayyah, the daughter of Rasulullah ﷺ. Salman Al Farisi RA also could not join the battle, as he was still not a free man. Asim ibn Thabit RA also participated in the Invasion of Hamra al-Assad, after staying at Hamra al-Assad for three days, Rasulullah ﷺ returned to Madinah. Asim ibn Thabit RA captured Abu Azzah al-Jumahi as prisoner. Abu Azzah had previously been one of the prisoners of Badr. Abu Azzah Amr bin Abd Allah al-Jumahi had been treated kindly by Rasulullah ﷺ after the Battle of Badr, being a poor man with daughters, he had no means to pay ransom, he was released after Battle of Badr, on the condition that he would not take up arms against Muslims again. But he had broken his promise and participated in Battle of Uhud. Abu Azzah al-Jumahi pleaded for mercy again, but Rasulullah ﷺ ordered him to be killed. Az-Zubair executed him, and in another version, Asim ibn Thabit. The father of one of Umar's wives, Umm Kulthum bint Asim, was Asim ibn Thabit RA. It is not clear if that person is the same person as the subject of this article is with regards to Saiyidina Asim ibn Thabit RA. Rasulullah ﷺ sent out ten men on a scouting expedition and put 'Asim ibn Thabit al-Ansari RA in command of them. They proceeded until they reached Had ‘a, which is between 'Usfan and Makkah. This during the Expedition of Al Raji. In 625 some men requested that Rasulullah ﷺ send instructors to teach them Islam, but the men were bribed by the two tribes of Khuzaymah who wanted revenge for the assassination of Khalid bin Sufian by Rasulullah ﷺ's followers and they killed the Muslim's. Rasulullah ﷺ informed his Companions about them on the day they fell. When they were informed that Asim ibn Thabit RA had been killed, some of the unbelievers of Quraish were sent to bring part of him that could be recognized. He had killed one of their great men on the Day of Badr. After killing Asim ibn Thabit RA, Hudhayl wanted to sell his head. Ever despaired in your Du'as? 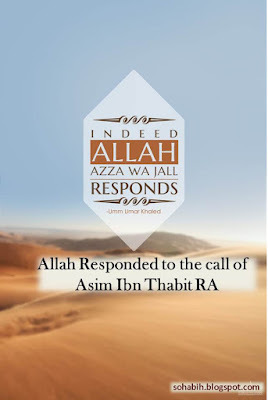 Ever thought that they are not answered or that Allah Azza Wa Jal doesn’t respond? Then, let me narrate to you of another the story of ‘Asim Ibn Thabit RA. During the Battle of Uhud, when the Muslims purportedly faced defeat though not reliably authenticated of the fact, the Quraish celebrated with their revenge but this was not enough for the ladies of their tribes. Hind, the woman who slaughtered the body of Saiyidina Hamzah RA, together with other women started to go out on the battlefield and started to dance and desecrate the dead bodies of the Mujahideen. Astagfirullah! Narrations say that in the passionate desire for revenge, these women slit up the belies of the Mujahideen, gouged out their eyes and cut off their noses and their ears. One woman among them shaped an anklet of the nose of a Mujahideen and put it on her feet and started dancing joyfully amidst the dead bodies. On this Salafah asked who killed them, and Jalas said it was 'Asim Ibn Thabit. Hearing this Salafah started to scream and swore by the false gods 'Uzza and Lat that her rage could not die down until she had taken revenge on 'Asim ibn Thabit and drank wine from his skull. After this, she indeed proclaimed that she would give any amount for the person who can bring her the head of 'Asim ibn Thabit, and this spread like fire amongst the Quraish. So one by one they started to search for 'Asim ibn Thabit. 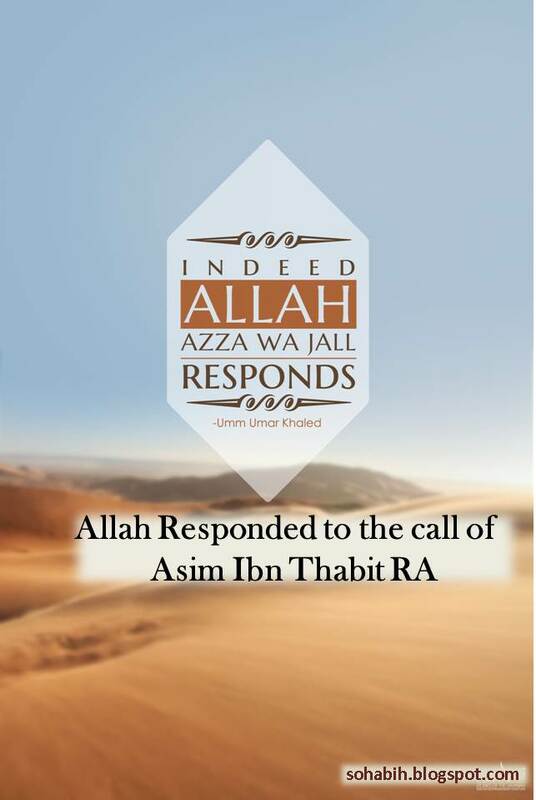 After the Battle of Uhud, Rasulullah ﷺ sent the Sahabah RA on a special mission with 'Asim Ibn Thabit RA as its leader. They were a few distance from Makkah when a group of Banu Hudhayl pursued them and ambushed them. The people tried to bribe the Sahabah RA and told them that they won’t be killed as long as they lay down their weapons. After this Asim Ibn Thabit RA attacked the enemy with two of his companions, they fought fiercely until they were martyred one by one. The three other surrendered and were killed, one committed suicide and the other 2 killed by the Banu Hudhayl. Now, this is where the power of du'a comes. 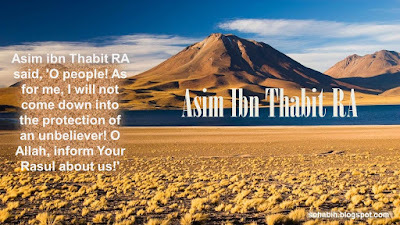 After few hours of the martyrdom of Asim Ibn Thabit RA, the Quraish learnt of the where about of his body which was lying in the area inhabited by the Banu Hudhayl.. So, with the hungry bellies of the Quraish for money, they started to give a lot of money to their messengers so that they could succeed in getting the head of Asim Ibn Thabit RA. When they succeeded, some men of the Banu Hudhayl went to the place where the body Asim Ibn Thabit RA was lying; when they were near it to cut off his head they found a whole lot of bees, wasps and hornets surrounding the body and head of Asim Ibn Thabit RA. Whenever they attempted to cut it these bees and wasps would attack them so they couldn’t do anything but give up and wait for the nightfall. The sun had not yet set when suddenly dark dense of clouds appeared on the sky, the very air seemed to tremble with the thunder and heavy rains had fallen. Soon the streets and roads took on the appearance of streams, low-lying areas were filled, and there was water everywhere. It rained heavily the whole night and the Banu Hudhayl went back to their homes. Next morning they came out to get the head of Asim Ibn Thabit RA but as they went towards the field the body was nowhere to be found. The flood washed it away to some unknown place; they searched high and low but the body of Asim Ibn Thabit RA disappeared like dust in the wind. Subhan'Allah. Look how Allah Azza Wa Jall responded to the du'a of His faithful servant Asim Ibn Thabit RA. Allah SWT sent down wasps and bees to cover his body as protection to these people who had the intention to use his limbs and whatever is left of him into devilish and sinful act of drinking wine. Allah SWT sent down heavy rain so that his body won’t be found and away from the Mushrikeen. Allah Azza Wa Jal will never allow the Mushrikeen to triumph over the Mu'mineen and this is how he protects His faithful servants. Similarly in Palestine, the Kuffar may plan anything against the Mu'mineen, but the Divine Plan overcomes all other plans. So never despair of His Mercy and never underestimate the power of your du'a. Remember Allah Azza Wa Jall knows what you are about to ask Him even if you haven’t uttered them, He is within You, Your heart itself, calls upon Allah Azza Wa Jall with every beat. May you all benefit from the story of Asim Ibn Thabit RA. Another version - The story of Asim Ibn Thabit RA the less known companion of Rasulullah ﷺ. Note: This is part of the collection of Golden Stories of the Sahabah Stories, which narrates and shares the amazing stories of the Sahabah RA as taken from excerpts of their lives. 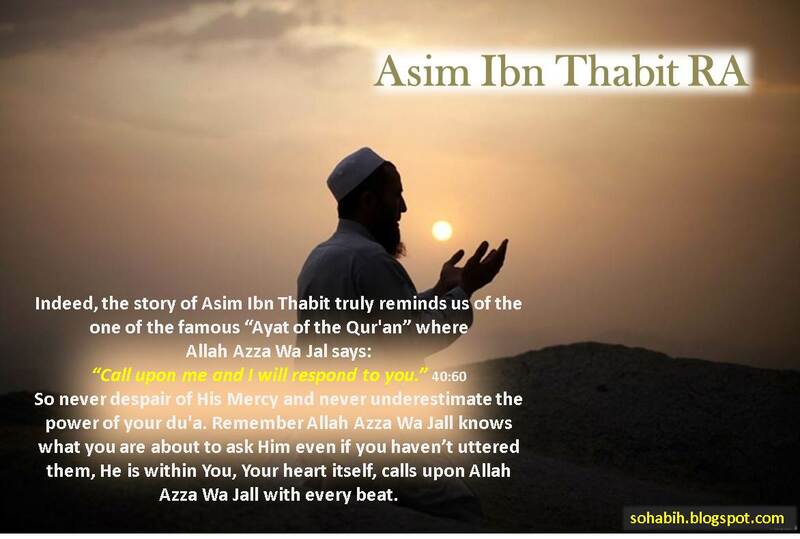 Asim ibn Thabit: The Companion whose Body Was Protected after his demised. Rasulullah ﷺ, was conversing with his companions before the battle of Badr when Rasulullah ﷺ asked them: "How do you plan to fight?" Asim ibn Thabit RA stood up holding his bow, and said: "If the enemy is a hundred yards away, I will shoot with the arrows. If they come within the reach of our spears, I will fight them until the spears break, then we will put them down and it will be time for dueling with the swords." Rasulullah ﷺ said: "This is indeed the way to combat! Anyone who fights, he should fight like Asim Ibn Thabit." This testimony of Rasulullah ﷺ attests to the skill of Asim Ibn Thabit RA in wars. His companions never forgot how bravely he fought during the battle of Uhud. After the battle's dust settled down, the pagan women rushed to the battleground mutilating the corps of the Muslim martyrs. They cut off ears and noses and made them into anklets and collars! One of them mounted on a high rock and shrieked at the top of her voice: "We have paid you back for Badr!" Salafah bint Sa’ad went out with them looking for her husband and sons. She was worried because she did not see them among the returning warriors. She penetrated deeply into the battlefield, scrutinizing the faces of the dead bodies when she saw her husband lying lifeless in a pool of blood. She looked frantically searching for her three sons. There they were lying on the ground not far from their father. As for her two first sons they were dead, but the third still had a breath of life within him. She put his head on her lap and wiped the blood from his face. She asked him: "Who struck you down my son?" Fighting the death rattle in his throat, he answered with great difficulty: "Asim ibn Thabit struck me, and he also killed my brother Musafi', and…" he rendered his last breath before he could finish his words. Salafah rose up, mad with rage and sorrow, she wailed and howled like a wounded beast. She vowed to take revenge for her husband and sons, for her anger and sorrow would not be alleviated until she would hold Asim ibn Thabit's skull in her hands and drink wine from it. She promised to give anyone who came with his head whatever he wished of gold and money. Now everyone in Quraish knew of Salafah's vow and every young man wished that he could be the one who would get the prize. Not long after the Battle of Uhud, Rasulullah ﷺ, sent six of his companions to an Arab tribe who newly accepted Islam to instruct them in the religion and to teach them to read Qur'an. 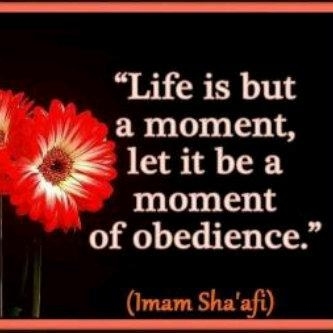 Among them was Asim Ibn Thabit RA. The group was on its way not far from Makkah, when a tribe from Hudhayl got news of them, and set off for their pursuit. While they were off their guard sitting with their belongings and arms next to them, men with swords in their hands surprised them and encircled them. They took their swords to fight them, but the men told them: "There is no way that you can overcome us, and by God we do not intend any harm for you if you surrender yourself. We swear by God we will not kill you." 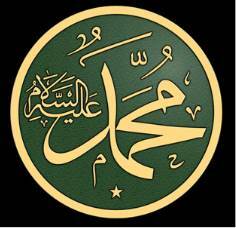 Rasulullah ﷺ’s companions looked at each other as if to consult each other as to what to do next. 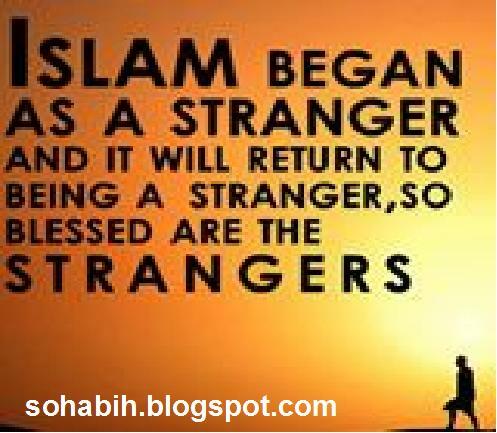 Seeing their hesitance Asim ibn Thabit RA exclaimed: "As for me, By Allah I will never accept an undertaking and agreement from a disbeliever." Then he added: "O Allah, I fight to defend Your Deen. O Allah protects my flesh and bones and do not let them fall into the hands of Your enemies." 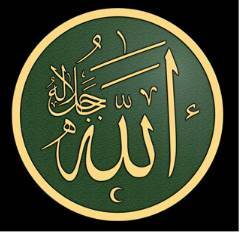 Thereupon Asim Ibn Thabit RA fought with his two friends until they were killed. As for the rest of the companions they chose to surrender, but soon their captors betrayed them and killed them all. Now the Hudhayl did not know that among those they had killed was Asim Ibn Thabit RA, and so when they realized who he was, they went back to the place of the battle to bring his skull to Salafah and win the prize. But when they wanted to get to him, they were surprised to find that swarms of bees and wasps were surrounding him! Whenever they tried to get near him the bees would sting them in the faces and the eyes. 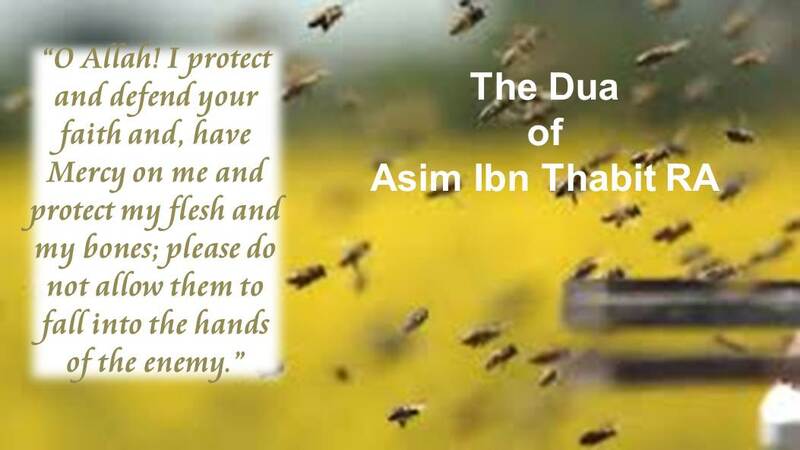 The insects protected the body of Asim Ibn Thabit RA and did not allow any of the disbelievers to even touch him. They finally gave up after many trials, when one of them said: "Let him alone until nightfall, then the insects will leave him and we can take his skull." Before even the day was gone the sky became dark with clouds and a heavy rain fell on the ground the like of which they have never seen before. Allah sent a flood in the valley. When the morning came they went back to the place to look for the body, but in vain did they search. They could not find it. That was because the flood washed it body away from them and it was never found. Allah has fulfilled Asim's prayer and has saved his flesh and bones from falling into the hands of the disbelievers! Asim ibn Thabit RA was killed during the Expedition of Al Raji. In 625, some men requested that Rasulullah ﷺ send instructors to teach them Islam, but the men were bribed by the two tribes of Khuzaymah who wanted revenge for the assassination of Khalid bin Sufyan by Rasulullah ﷺ's followers and they killed the Muslim's. After killing Asim ibn Thabit RA, Hudhayl wanted to sell his head. Not many hadith narrated by Asim Ibn Thabit RA - apart from the narration from Abu Hurairah RA of his sacrifices and piousness in the path of Allah SWT. The various version and stories on this page only depicts and reveal just a brief sacrifices of Asim Ibn Thabit RA during the early hour of Islam.